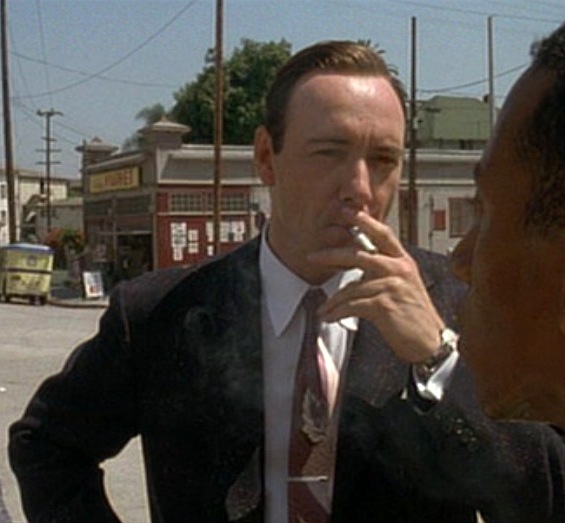 Kevin Spacey takes a drag from a Chesterfield as Jack Vincennes in L.A. Confidential (1997). Back at work today? It’s okay, none of us want to be, especially after losing an hour of sleep last night. However, you could disguise your Monday blues by emulating Sgt. Jack Vincennes’ on-the-job style. In an earlier post, I focused on Sgt. 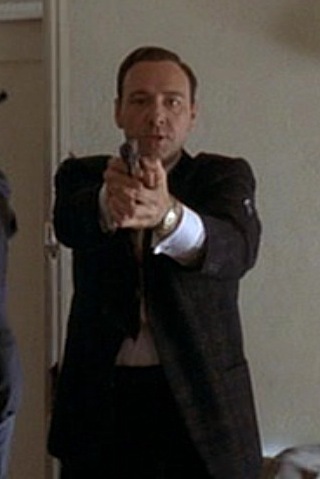 Vincennes exuding his celebrity status through his attire during a Christmas Eve party and how it differed him from the other main characters of Curtis Hanson’s neo-noir exploration of crime and corruption in Los Angeles. After Vincennes’ celebrity detective phase is cut short by a suspension, he is forced to produce good results in order to move out of vice and get back his cushy spot as a narcotics detective and TV show technical advisor. The only way to do it is to crack down and actually work. While this may appear to be a horrifying choice to a man mimicking the easy charm and hedonism as Dean Martin, Vincennes brings his own casual efficiency to the table and manages to get a killer lead on his first try (pun). You all know that guy at work. You hate that guy… unless you are that guy. Despite his standard evening wear of colorful jacket and slacks, Vincennes wears a standard dark suit, white shirt, and tie to work everyday. Naturally, the suits have his own personal flair in terms of color and style, differentiating him from squares like Exley. The day after the Nite Owl massacre, Vincennes likely knew he’d be put into action in one of the 48 two-man teams patrolling the city. For this, he would want something comfortable for driving around all day, but still fashionable – this is L.A. after all. And since it is L.A., which experiences temperatures in the high ’60s in January, Vincennes wisely sports a sport coat and slacks. Fashion plate Vincennes doesn’t just opt for any sport coat either. The epitome of contemporary style, Vincennes wears a black atomic blazer with a rust-colored fleck pattern throughout. The atomic fleck jacket is a very era-specific popular look from the 1950s, mostly made famous by movie stars and rockabilly musicians. It was the perfect garment for cool cats in the Jet Age; it would shine in the sunlight and make a man look just a little bit better than the guys around him. It’s a very appropriate choice for “Hollywood Jack”. See that rust-colored pattern you can’t really describe? That’s “Atomic Fleck”. Vincennes’ particular jacket is single-breasted with wide notch lapels and a 2-button front, worn open both for a casual look and to allow Vincennes a quicker draw. It has padded shoulders, but the casual way he wears it keeps them from exaggerating his look. It is ventless and offers a full 1950s-style cut, providing a further contrast to the more suppressed-looking Exley. The jacket has 3-button cuffs, patch hip pockets, and a welted breast pocket, accentuated by a triple-pointed white linen handkerchief puffing out. Exley was always nicely dressed too – in a repressed, buttoned-down sort of way – but his comparatively conservative flannel jacket and repp tie are no match for Jack’s atomic fleck blazer and silk tie. Vincennes looks too for school, while Exley just looks like… school. Vincennes’ silk tie is another glaring indication that this man was at the top of the fashion game in 1953. Bordering on being a kipper tie – which have the reputation of being too wide and far too loud – Vincennes’ tie is purple and beige silk with two or three leaves breaking up the monotony as they gently fall down to the tip. He fastens the tie to his shirt with a narrow silver tie bar that is nearly lost in the shuffle but keeps the tie firmly planted just where he wants it. The shirt is white since he is a professional, after all. It has a spread collar with points of above-average length, a front placket, and a breast pocket with “JV” monogrammed on the top. The shirt has double/French cuffs, through which Vincennes wears a pair of flat silver cuff links. Like everything else, the shirt has a larger fit and puffs out over the rear of Vincennes’ trousers when he’s not wearing his jacket. Vincennes wears a pair of dark charcoal pleated trousers which rise above his natural waist. The trousers also have a generous fit, roomy through the legs down to the cuffed bottoms. In addition to the side pockets, Vincennes’ trousers have two jetted rear pockets. He wears a black leather belt, fastened in the front through a squared brass clasp. He keeps his gun holstered on the right of his belt. The trousers break over a pair of black leather loafers, naturally matched with black dress socks. He wears the same accessories throughout the film: a gold black-faced diamond pinky ring and a Bulova Waterproof wristwatch on a stainless bracelet with brown leather inserts. Here, we also get to see Vincennes whip out a fashionable pair of tortoiseshell-framed sunglasses with gold lens rims and brown lenses. They resemble the classic Ray-Ban Clubmaster and are very similar to the sunglasses worn by Warren Beatty in Bugsy. Look at Exley. Now look at Vincennes. Who do you trust more? Eh, probably Exley. But who would you rather talk to? Obviously Vincennes. While he looked more fashionable at the time, Vincennes’ look would’ve been severely outdated within a few years. The Man in the Gray Flannel Suit was the top look in 1960, but soon suits were out and hippie culture was in, surpassed by disco, then pastels, then hammer pants. Vincennes lived too much for the moment, and neither his style nor his character would survive past the film’s timeline. As discussed in the previous post, Vincennes’ sidearm is a Colt Commander, a more compact variant of the venerable M1911 pistol developed for the U.S. military in… 1911. While the standard M1911 is typically chambered in .45 ACP, the smaller Commander has also seen chambering in 9×19 mm Parabellum and .38 Super. It was first introduced in 1951, two years before the film takes place, so the novelty of such a newly developed pistol would fit the voguish Vincennes. His also has customized white grips, providing a stark contrast against the blued steel frame. It’s a good-looking piece, but Vincennes’ loose grip on it leaves something to be desired. At just under 8 inches long, the Commander is a more concealable alternative to the M1911 Government or Army models. The barrel is also ¾” shorter at 4.25″ long. It is comparatively lightweight due to the aluminum alloy frame. In 1970, a sturdier variant of the Commander was developed with an all-steel frame (“Combat Commander”) and the previous Commander was rebranded as the “Colt Lightweight Commander”. Oh, lookee here: the great jerkoff case of 1953. April 6, 2014 - 9:55 pm M.
A little late replying to this, but Spacey is Jack Vincennes in my mind. After reading this post I went back and read the book which I read about 15 years ago. Vincennes is a much more complex character in the book obviously. Skeletons in the closet, reformed, then off the wagon again, a pariah in Hollywood after his falling out.. Redeeming himself then shot in the face at the end, months away from his pension. Do yourself a favor and…buy the book. Keep up the good work. I don’t know how you do it.